Users of Linux-based operating systems often buy Windows-powered computers, format the hard drive and install their favorite distro. This can sometimes be a fine experience, although, quite often, it comes with annoyances such as non-working hardware (usually Wi-Fi). Not to mention, the keyboard will likely house a "Windows" key, which taints the experience. So, how did the company choose which fans to fly to its headquarters? It leveraged social media to ask followers to submit anything showing that they are a superfan. The rules were quite loose -- you could pretty much submit anything. System76 shares the full list of the winners and their winning submissions below. Helena Bales: Sent a story about how she uses Ubuntu for 3D modeling, hacking raspberry pi and building a reforestation drone and its website with very little sleep. READ MORE: Are you the ultimate System76 superfan? Win a trip to its headquarters in Denver! These submissions largely shared a common trend -- making and creating. System76 isn't just selling computers, but striving to inspire those that buy them to do things with them. I know, it sounds like marketing-speak, but there is sincerity in the mission. When you buy one of its machines, it ships in a boring box -- on the outside, at least. Inside, however, the packaging is decorated with doodles that show art and creativity. There is symbolism here. A computer on its own is just a tool. It is what you create with it that makes it exciting. True, many of us hardware nerds geek out about the actual tool too! The company is headquartered in Denver and I am a Long Island guy. This meant taking quite the long trip to attend a short two-day fan event. I am scared of flying -- turbulence, actually -- so I normally wouldn't travel so far for such a short stay. However, as a Linux fan and user, visiting the System76 office was just too cool to pass on. Luckily, once at the Colorado office, the long flight -- full of me praying to God every time the plane shook -- proved to be worthwhile. 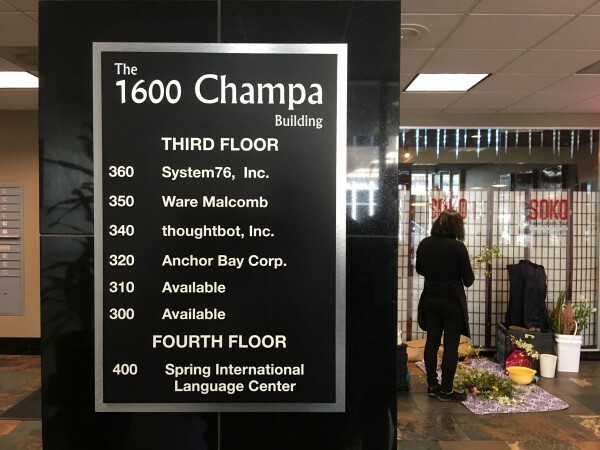 The office itself is hidden in a building that highlights the business diversity of Denver -- it is two floors above a Barbershop and Sushi restaurant. Certainly not a sprawling campus like with Apple, Microsoft, HP or the like. Once inside, I looked around in wonder, as the place was decorated like a geek's heaven. It was mostly open -- a series of tables where the employees work, decorated as you would expect -- vinyl figures, bottles of mountain dew and other stereotypical nerd things. 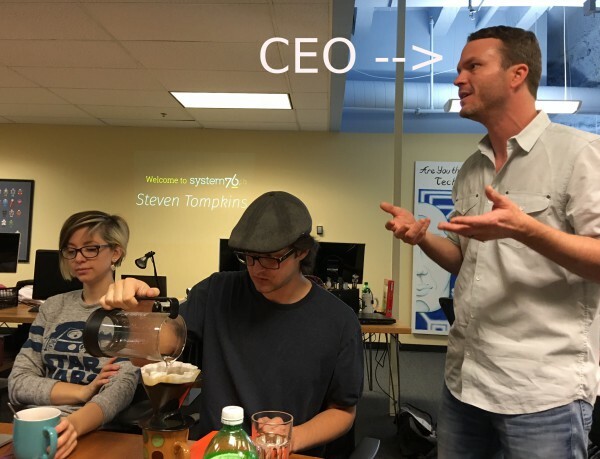 While I do not drink beer, the System76 employees do -- occasionally while working -- but not constantly. 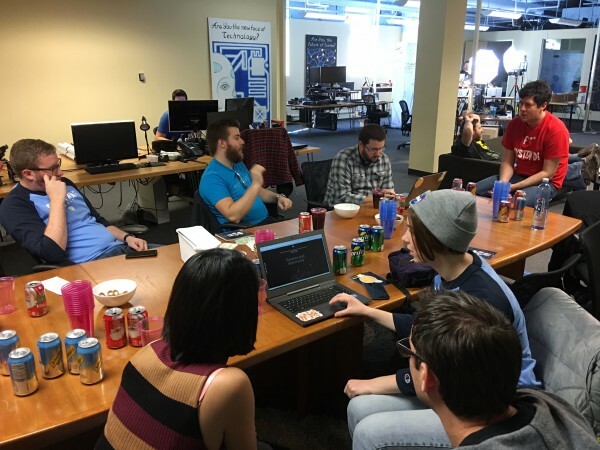 No, they are not getting drunk, but instead, relaxing with craft offerings as they collaborate and ponder the future of computing, Linux and open source. It is sophisticated and trendy. This is a reflection of Denver, as craft beer seems to be a big staple of the culture. I mention the beer drinking to highlight the relaxed atmosphere. All of the employees, from top to bottom, seem very happy. The same can not be said for many companies. In fact, I got the impression that no one would ever voluntarily leave. Working somewhere you can truly express yourself and give input is rarefied air nowadays. As cool as it was to take in the visuals myself, it was much cooler to watch the contest winners experience it. I imagine it is the same look that children get when entering Disney World for the first time -- wide eyes and big smiles. 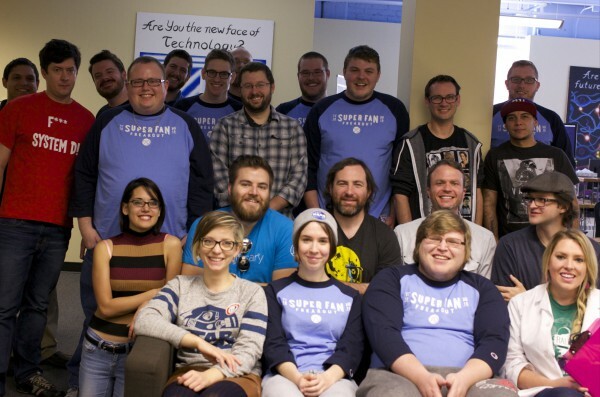 It was truly an emotional experience for the superfans and I could tell that the System76 employees were touched by that. The fun began with a tour of the office. On the right side there are two rows of counters that are home to System76's entire product line. It is here that testing is done. 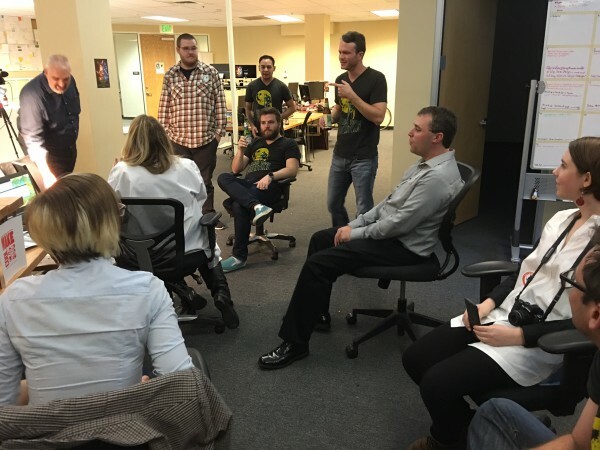 An employee can walk up to any of its offerings and get hands-on experience. In other words, they can get to know the products intimately. This likely contributes to the employees' emotional investment in the company and its customers' satisfaction. Seriously, they truly care about the customers, and it shows. To the left of that was a really cool open source project involving sand and a -- gasp -- Microsoft product. System76 has a sandbox on a table, full of sand. Above it, suspended from the ceiling, a Microsoft Kinect camera is pointed at the sand and connected to a laptop running Ubuntu. Also connected to the laptop is a traditional projector, which is projecting onto the sand from above. The Kinect sensor measures the height of the sand, while the projector projects topographical colors onto it. The "valleys" can even be filled with water when it "rains". Your hands become the rain clouds. It is pretty incredible. You can see the video above to learn more. Next to this open source sandbox is an all-purpose room which has become a dedicated gaming area. Two System76 desktops are connected to large 1080p televisions. The cool thing, however, was the Steam controllers connected to them. This was my first experience using the controller, and I came away impressed (I need to buy one!). 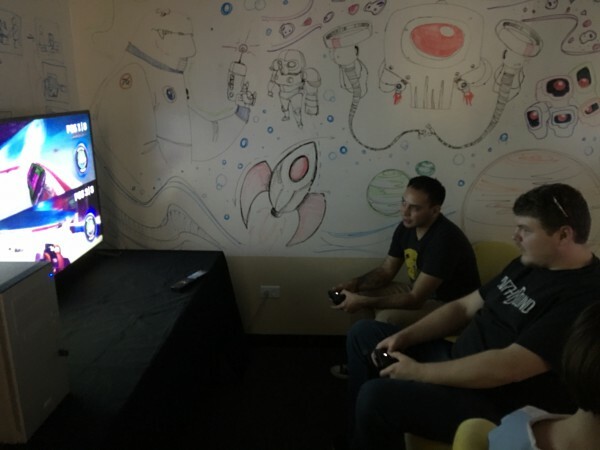 While the System76 team obviously has fun with gaming, it is also refreshing to see that they are on top of Linux-gaming for the sake of its customers too, including testing the innovative controller. Next up, we were treated to another open source project. 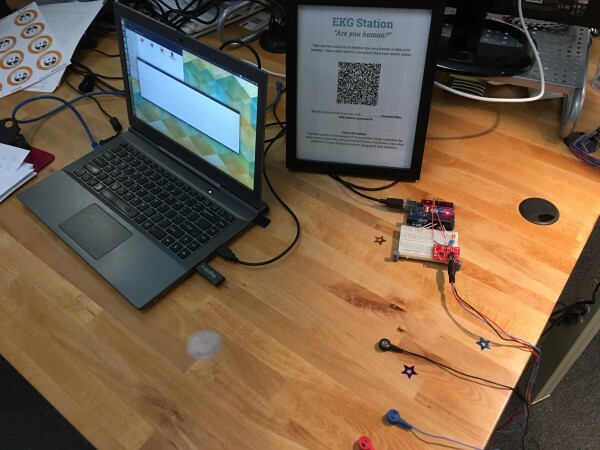 The System76 team connected an Arduino board to a Ubuntu laptop. The board was then wired with EKG contacts. They had us connect one cable to each arm, and one cable to our ankle. We were then asked a series of questions to determine if we were humans or not. I am not sure the science behind it is particularly sound, but it was certainly interesting to be asked morality questions, such as if we would help a distressed animal, or funny questions such as if coffee makes us poop (for me, it does). Based on the spikes on the EKG monitor, it could be determined if we were lying or being truthful. About half of us, including me, were deemed to be humans. Comically, being a group of proud Linux nerds, we were sad not to make the cyborg group! After a long day of playing with System76 computers and experimenting with cool open source projects (aka Heaven), the Superfan contest winners, plus myself, retired for the day. Those with stronger social skills and younger bodies opted for a night out together. Older and duller folks like me headed for their beds at the hotel. After a long day of travel and fun, I needed my beauty rest. The next day, however, was much more purposeful, as System76 conducted a brilliant round-table with its CEO, Carl Richell. It was refreshing to see Richell pick the brains of his company's biggest fans. 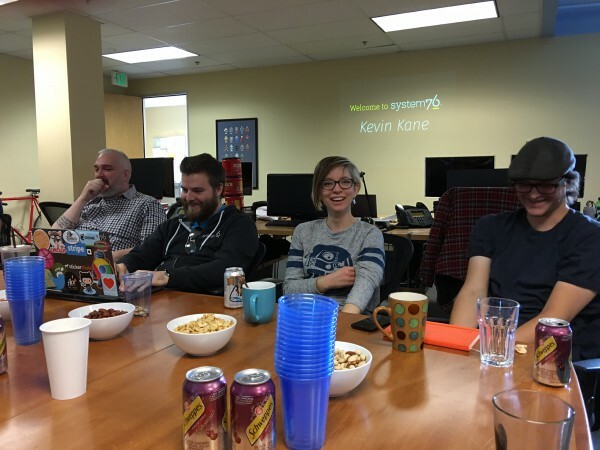 While some executives just like to hear themselves talk, he instead listened -- sincerely interested in everyone's opinions on Ubuntu, Linux, open source, and technology overall. When he weighed in on issues himself, you could tell that he was a true Linux fan with a passion for making great products and creating positive customer experiences. 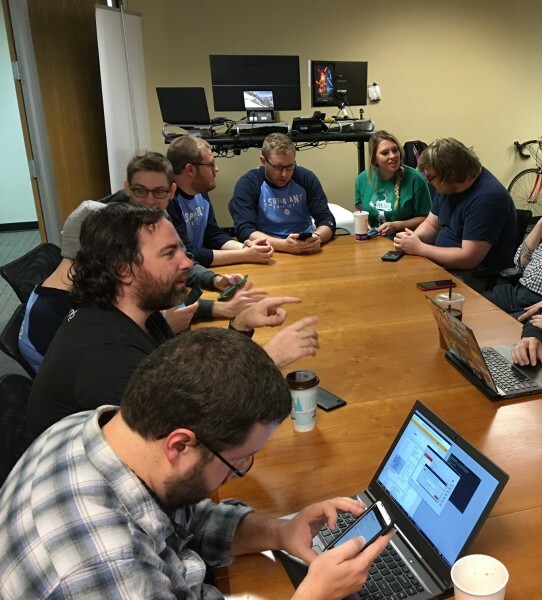 One of the big topics of conversation was convergence and Ubuntu phone. This was quite polarizing. While everyone generally liked the concept of having a smartphone that can double as a powerful desktop, the execution and viability of such projects were called into question by some. As someone who was underwhelmed by Microsoft's lackluster continuum, I weighed in with that experience -- Ubuntu definitely has an opportunity while the Windows-maker's mobile offerings continue to falter. After the round-table, there was a little more time to play with everything before we were off to the airport. As I traveled in a shared van with some of the other winners, we had a good time talking about Linux and reminiscing about our fondest memories of technology from the past. It was a wonderful end to the System 76 superfan experience -- Linux fans geeking out and having fun. 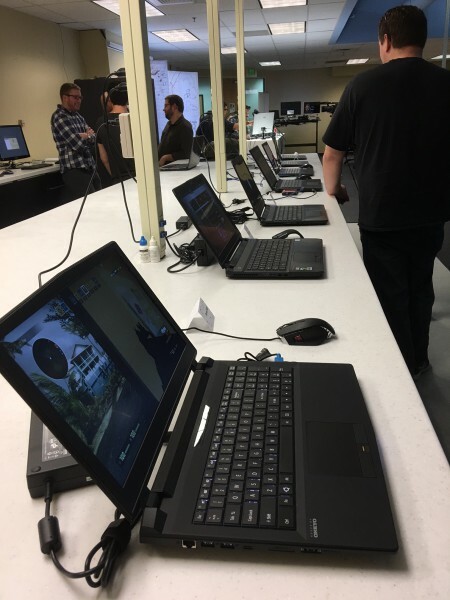 Overall, System76's event was a smashing success -- the company gained some valuable insight from some of its most loyal customers, while the superfans got to experience something unique -- something they will cherish forever. It is similar to finding the golden ticket in Willy Wonka, but rather than a chocolate factory, it was an Ubuntu computer manufacturer's office. Am I suggesting that Carl Richell is like Mr. Wonka, and his staff is like Oompa Loompas? Sure, why not! For the Superfans, their hospitality was extra sweet. 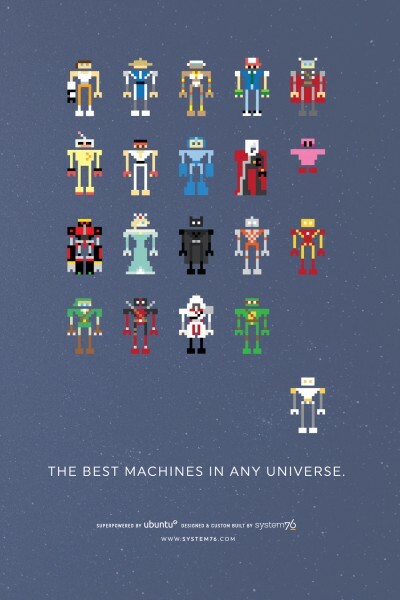 To celebrate the first-ever System76 Superfan event, the company is giving away a really cool poster (seen above) when you buy one of its machines. In order to qualify, simply write '#System76fan' in the instructions of your order. This promotion is running until January 4th, so it is perfect for Holiday Shopping. You can buy a System76 computer by clicking here.